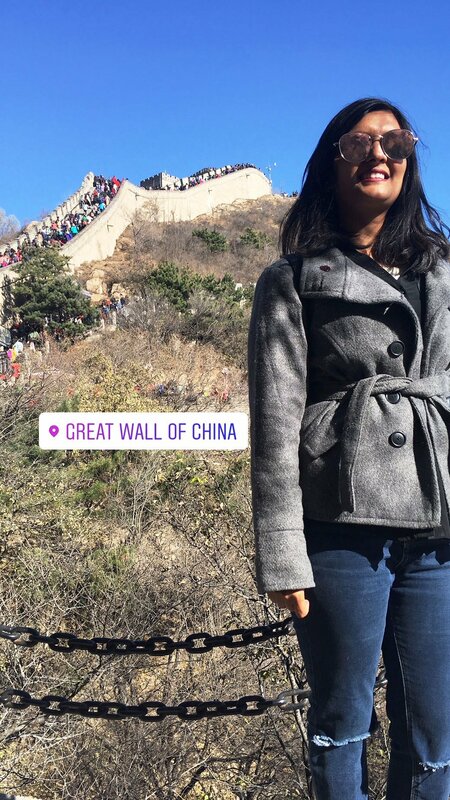 We were in Beijing for less than 2 days and our whole purpose of making the trip to the city was because of the Great Wall. We travelled to the Badaling side of the Great Wall since it is more popular and better maintained. Also, the connectivity is greater. However, it was so so crowded that I would suggest anyone else travelling with the expectation of a better Great Wall experience to may be try a less crowded side like Mutiyanu. Other things of interest are Ming Tombs, Forbidden City, Tiananmen Square etc. Since we had very limited time in Beijing we had taken a guided tour to most of these places. The tour included a trip to the Jade factory which was exorbitantly expensive and a waste of time. I did however enjoy the traditional Chinese tea ceremony. The tour also included a community Chinese lunch. Ofcourse, the best part about the trip to Beijing was the journey from Shanghai to Beijing in a bullet train. Shopping: Shopping in Shanghai or Beijing is like any other big city. Almost every well known label and designer wear is readily available. I also managed to visit the underground AP Plaza market famous for its first copies and a huge collection of other shoppable stuff. There are other such markets as well but this one seems to be the most popular with tourists since almost all shopkeepers speak English. I did pick up a few things but the quality is quite questionable. Iy loved to chit chat with shop owners and they loved indulging her with smiles and conversations (probably the only people I met in my entire trip who spoke decent English- apart from hotel reception staff and tourist information desk people). We also loved the little cafes and eateries in the market. You can find options from both Chinese and European fare. Kids under five do not have to buy tickets anywhere be it the metro, trains, zoo etc. Chinese love kids! Iy was smothered with hugs and smiles and cute faces whenever she boarded a metro or walked inside a mall. Yes, they are very expressive of their affection and do not understand personal space and boundaries (not that I am complaining). There were times when older women would ask me (through actions since we did not speak each others language) why I had only one kid. Yes, it sometimes borders on embarrassing but mostly the conversations are fun J. The public toilets can be best described as hole in the ground. While K and I have seen a lot of them while growing up in India, Iy was in for a complete surprise. Thankfully, she loved the “Indian toilet” format! People in China are extremely warm. But, like I said, they sometimes forget personal space. I also admired the fact that they take care of public property like their own. Connectivity: Internet is extremely high speed at most places. We bought a local sim with 4G connection when we landed and it served us quite well. It cost us about 5000 INR for 2 sims for a week’s worth of internet and calling. Sites and apps like fb, insta, whatsapp, google etc are blocked and you will have to download a VPN to access them. Curency: 1 CNY is about 10 INR. You can manage to eat for about 150-250 CNY at a decent place. Alcoholic drinks extra. Travel in the metro is very cheap at about only 3 to 12 CNY depending on how far you are travelling. Cabs are slightly higher at 25 to 100 CNY. Travel from the Pudong airport to the centre of the city is about 200-250 CNY. Some must try food includes their traditional crepes called Jianbing, the amazing variety of buns and dumplings, fried sticks, walnut mooncakes and the huge selection of crisps. Check out my insta post on food and etiquette in China here. While we did not stay in China long enough to form opinions, we know for sure that we would like to visit the country again one day!